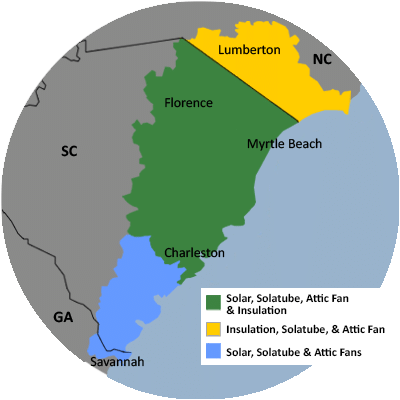 For a FREE no-obligation estimate in Georgetown, SC, please fill out the form to the right and Carolina Energy Conservation will contact you shortly. We request an energy audit. I would like a quote for attic insulation. Looking for quotes to spray ceilings and walls. We are going to be building a house in Georgetown and are working on our budget. We want to know the cost of insulated with foam insulation. Looking for a solution to fire proof material installed in buildings on our mill site. I have read about fire proof spray foam, currently looking for a vendor. We specialize in a variety of services aimed to lessen your home's carbon footprint and save energy and money each month! We offer it all, from air sealing to ductwork to insulation and HVAC services in Georgetown, SC. For a FREE, no-obligation services estimate in Georgetown, SC, you'll also receive a free copy of "Saving Energy and Money at Home," a great book to use as you begin to create a more comfortable, healthy, and energy efficient home!